The amount and quality of dietary fatty acids can modulate the fat metabolism. This dietary intervention is based on the different metabolic pathways of long-chain saturated fatty acids (LCFA), which are mostly stored in adipocytic triacylglycerols, medium-chain fatty acids (MCFA) which are preferentially available for hepatic mitochondrial β-oxidation and n-3 long-chain polyunsaturated fatty acids (n-3 LCPUFA) suggested to modulate fat oxidation and storage by stimulating the peroxisomal β-oxidation. Combined dietary MCFA and n-3 LCPUFA without LCFA may synergistically stimulate fatty acid oxidation resulting in blood lipid clearance and LCFA release from adipocytes. In a short term, parallel, randomized, double-blind trial effects on the fatty acid metabolism of 10 healthy volunteers (Body Mass Index 25–30) of a formula containing 72% MCFA and 22% n-3 LCPUFA without LCFA (intake: 1.500 kcal/day; fat: 55.5% of energy) were measured in comparison to an isoenergetic formula with equal fat amount and LCFA dominated lipid profile. The plasma triacylglycerol (p < 0.1) and cholesterol (p < 0.05) content decreased in the test group. The n-3/n-6 LCPUFA (≥ C 20) ratio increased (p < 0.0001) after 4 days treatment. The LCFA content was similar in both groups despite missing LCFA in the test formula indicating LCFA release from adipocytes into the plasma. Both groups significantly reduced body weight considerably 4 kg (p < 0.01) and fat mass up to 50% of weight loss (p < 0.05). Combined dietary 72% MCFA and 22% n-3 LCPUFA without LCFA stimulate the fatty acid oxidation and release from adipocytes without affecting any safety parameters measured. Dietary long-chain saturated fatty acids (LCFA; ≥ 16 carbon atoms) are an important nutritive energy source which can be strictly incorporated into the adipocytic triacylglycerol stores dominating the fatty acid composition of adipose tissue . In contrast, medium-chain fatty acids (MCFA; 8–14 carbon atoms) as well as long-chain polyunsaturated fatty acids (n-3 LCPUFA; ≥ 18 carbon atoms) are limited storable and follow different pathways of digestion and metabolism . Triacylglycerols containing fatty acids with more than 12 carbon atoms must be hydrolyzed in the intestinal lumen before absorption. In the enterocytes they will be re-synthesized to triacylglycerols and preferentially used for the formation of chylomicrons [3, 4]. From the chylomicrons LCFA are released by serum lipases to be metabolized by tissue or stored in the adipocytes. Triacylglycerols containing MCFA can directly be absorbed without hydrolysis and preferentially transported through the portal venous system to the liver. On the hepatocellular level, the carnitine acyltransferase, which is the enzyme system necessary for LCFA transport across the inner mitochondrial membrane is not required for MCFA . Thus, MCFA are more available for the mitochondrial β-oxidation whereas most LCFA are incorporated into triacylglycerols in the hepatocyte. As MCFA bypasses the adipose tissue lipoprotein lipase-regulated metabolic pathway of LCFA the lipid deposition into adipocytes may be limited by dietary MCFA intervention . Additionally, it has already been shown that dietary intervention with MCFA increased thermogenesis  and endogenous oxidation of LCFA [8, 9]. Also, the metabolic pathway of n-3 LCPUFA differs from that of LCFA. Data from animal  and human studies  suggest that n-3 LCPUFA may modulate the metabolic balance between fat oxidation and storage. Schulz and colleagues could demonstrate that n-3 LCPUFA can stimulate the peroxisomal β-oxidation resulting in an increased basal fatty acid oxidation . Therefore we hypothesized that a MCFA and n-3 LCPUFA rich but virtually LCFA free diet may result in a stimulation of the total fatty acid oxidation accompanied by an increased endogenous oxidation of LCFA. This might result in lipid blood clearance and LCFA release from adipocytes. To prove this hypothesis, a placebo controlled study was designed to investigate the short term effect of a fat rich but hypoenergetic experimental diet combining MCFA and n-3 LCPUFA on plasma fatty acid profile and fat metabolism. Ten healthy volunteers with a body mass index (BMI) between 25–30 were enrolled in the study. The most relevant characteristics of the subjects are shown in Table 1. The intervention was planned as a hypoenegetic diet. Daily 800 ml of a ready to use formula drink (1200 kcal) was administered. During the intervention it was not allowed to add dietary fat but 300 kcal carbohydrates up to a total energy intake of app. 1500 kcal/ day. The two test formulas contained 55.5 % of total energy as fat. The fat blend of the experimental formula was nearly free of LCFA (sum of palmitic acid and stearic acid 1%) but contained 72 % MCFA and 22 % n-3 LCPUFA of total fat. The fat blend of the placebo was composed from vegetable oils with a LCFA dominated lipid profile. The formulas were vitamin, mineral and fiber supplemented. The composition and the fatty acid profile of the formulas are shown in Table 2. The trial was performed as prospective, randomized, double-blind and placebo controlled study with a parallel group design. The study protocol was approved by the local Ethical Committee and written consent was achieved from all volunteers. At enrolment, the volunteers were randomly allocated to one of the two formula groups. The last day before starting the diet was defined as day 0 and the first day of using the formula was defined as study day 1. The intervention period was 15 days. At day 0, 4, 7, 9, 11 and 15 20 ml venous blood was obtained, the plasma separated and stored at -20°C until analysis. Urine was collected for 24 hours and a sample of 100 ml was separated from the pooled 24 hours urine. The sample was stored at -20°C until analysis. At days 0, 4, 7, 9, 11 and 15 body weight and at day 0 and 15 the fat mass was determined. The formula assessment of tolerance was tested by a day to day questionnaire focused on feeling of satiation and abdominal symptoms using a five point scale. The body weight was determined in kg. The fat mass expressed as percent of body weight was measured by body impedance analysis (BIA) using the Data Input 2000–1 Body Impedance Analysis System (Data Input, Frankfurt a.M., Germany). The plasma of the blood samples were separated by centrifugation 3360 × g for 10 min. In the plasma the concentrations of glucose, cholesterol, urea and triacylglycerol were measured and the fatty acid profile in the different lipid classes was determined. Additionally, the activity of liver enzymes (γ glutamate transaminase (GGT), glutamate oxalacetate transaminase (GOT), glutamate pyruvate transaminase (GPT) and the activity of the pancreatic lipase were determined. In the urine the concentrations of creatinine, urea and ammonia nitrogen were measured. With exception of the fatty acid profile all measurements were performed according to the standard methods of the University Clinic Giessen performed with Roche/Hitachi tests using the Sysmex-XE3000 and SE9000 Hitachi-Roche analysis systems (Roche, Basel, Switzerland): glucose and urea were determined by UV-tests, cholesterol, triacylglycerols, lipase, and ammonia nitrogen were analyzed by enzymatic color assays, GOT was determined according to the Sysmex test (IFCC/SM94) without pyridoxalphosphate, GPT according to the Sysmex test (ALT/GPT IFCC) with pyridoxalphosphate, and GGT with GGT Szasz liquid, creatinine was determined by the Jaffe method. The fatty acid profile of blood plasma was determined by fatty acid methylester (FAME) analysis. Total lipids of the supernatant were extracted according to Bligh and Dyer . For derivatization, an aliquot of 3 mg total lipid extract was resolved in 2 ml methanol/hexane (v/v) 4:1 plus pyrogallol and was methylated with 200 μl acetylcloride at 100°C for 1 hour; 5 ml 6% K2CO3 was added and centrifuged for 10 min at 2200 × g according to Lepage . The upper hexane phase containing the FAME was removed and dried with Na2SO4. The FAME were analyzed by capillary gas-liquid chromatography on a LS 32 Varian Chrompack system (Varian Chrompack, Middelburg, The Netherlands), as previously described by Kohn et al. .
Data are given as mean ± standard deviation. Intra-group comparisons (measurement day 15 vs. 0 and inter-group comparisons between the two tested groups were performed parametrically with the one-sided paired and with the one-sided unpaired t-test, respectively. The tolerance data on satiation and abdominal symptoms (85 point scale) were analyzed by contingency table analysis. As software Statview 4.5 (SAS Inc.) and SPSS 11.0 (SPSS Inc.) were used. P < 0.05 was considered as statistically significant. The most relevant characteristics of the subjects of the two groups indicated no significant differences (Table 1). In the test group the plasma triacylglycerol content decreased after 15 days of dietary intervention from 180.6 ± 84.19 mg/dl at day 0 to 103.6 ± 13.9 mg/dl at day 15 with a clear tendency (p < 0.1) in contrast to the placebo group with less decrease of 129.0 ± 80.1 mg/dl pre- to 116.6 ± 59.0 mg/dl post-treatment (p = 0.244) (Figure 1). Furthermore, the cholesterol concentration decreased from 233.0 ± 58,0 mg/dl at day 0 to 188.4 ± 36.4 mg/dl in the test group and from 204.8 ± 55.3 mg/dl at day 0 to 182.6 ± 38.5 mg/dl at day 15 significantly (p < 0.05) (Figure 1). 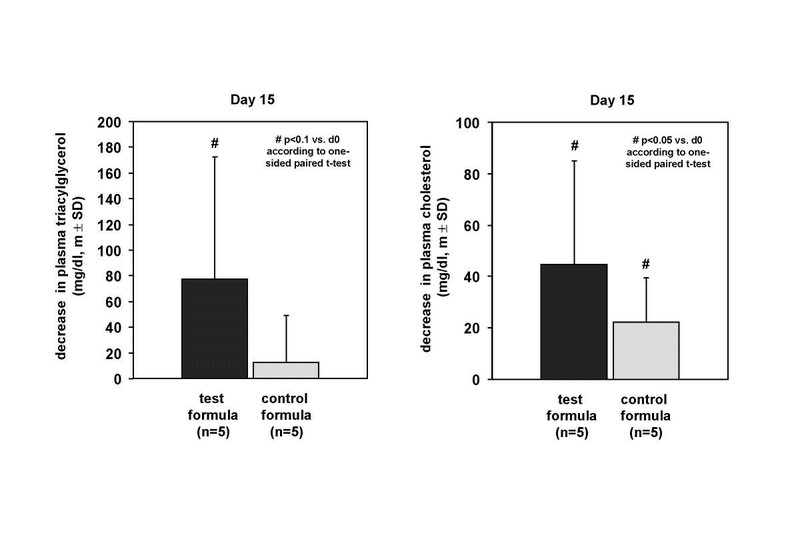 Decrease in plasma triacylglycerol and cholesterol after 15 days of dietary intervention with the high fat formula combine 72% MCFA and 22% n-3 LCPUFA without LCFA and placebo. The fatty acid profile of plasma reflected the dietary intake not always. The concentration of biochemical blood fat indicators, like oleic acid (C 18:1 n-9) decreased slightly 14.0 ± 11.4% in the test group but not in the placebo group. Although LCFA were missed in the test formula the plasma content of prominent LCFA fatty acids, e.g. stearic acid (C 18:0) (Figure 2), was similar comparing both groups with a decline of 9.8 ± 6.5% % in the test group (p < 0.05) and 13.0 ± 11.7% (p < 0.05) in the control group with no significant group differences during the treatment period. Due to the fact that there is 0.8 wt% arachidonic acid (20:4 n-6) in the test formula and nil in the placebo the arachidonic acid plasma level increased 32 ± 18.9 % pre- to post-treatment significantly (p < 0.05) in the test group and increased slightly 18 ± 13.5 % in the placebo group (Figure 2). 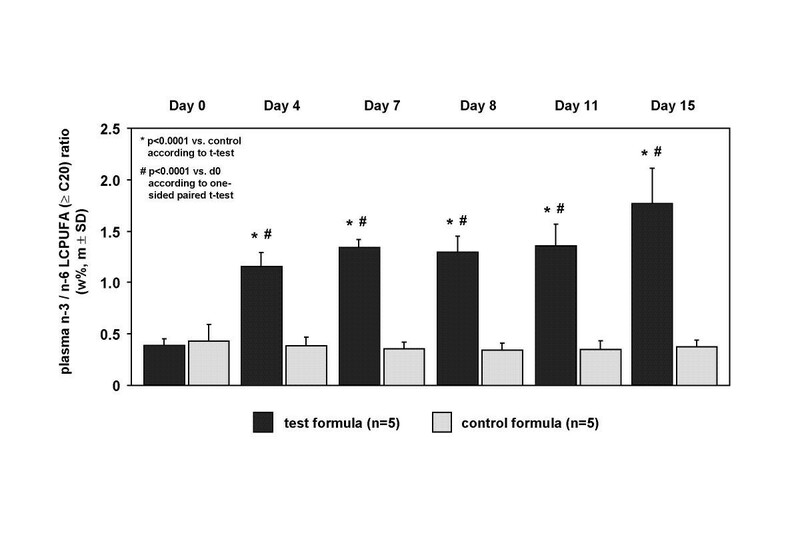 Likewise, the concentration of 14.4 wt% n-3 eicosapentaenoic acid (C 20:5 n-3) in the test formula and nil in the placebo was reflected by a significant increase from 0.7 ± 0.2 wt% in the test group at day 0 to 10.8 ± 3.4 wt% at day 15 (p < 0.01), in contrast to the placebo group with a decrease from 0.8 ± 0.3 wt% at day 0 to 0.5 ± 0.16 wt% at day 15 with a significant difference between both groups (p < 0.0001). After intervention linoleic acid (C18:2 n-6) decreased in the test group with 32 ± 13.2 % but not in the placebo with 4.3 ± 19.0% decline. Concerning this the difference between both groups at day 15 was significant (p < 0.003). Consequently, the n-3 to n-6 LCPUFA ratio (≥ 20 carbon atoms chain length) increased in the test group significantly (p < 0.0001) compared to the placebo intervention shown in Figure 3 as a time course profile at day 0, 4, 7, 9, 11 and 15 of dietary treatment. Comparing both groups, this alteration of plasma fatty acid composition was already pronounced at day 4 (p = 0.0001) but the maximum effect was observed at day 15 in the test group. 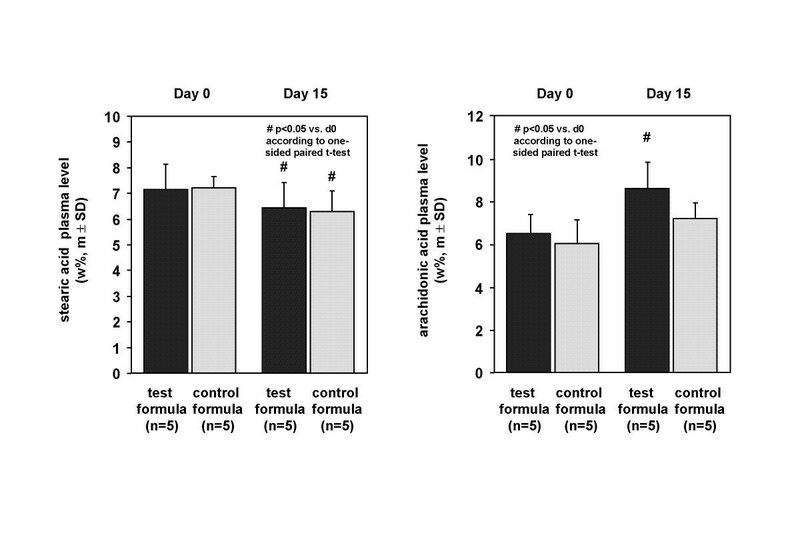 Alterations of plasma concentration of stearic acid and arachidonic acid at day 0 and day 15 of dietary intervention with the high fat formula combine 72% MCFA and 22% n-3 LCPUFA without LCFA and placebo. Alterations of plasma concentration of the n-3/n-6 LCFA ratio (≥ C 20) at day 0, 4, 7, 9, 11 and 15 days of dietary intervention with the high fat formula combine 72% MCFA and 22% n-3 LCPUFA without LCFA and placebo. Furthermore, several safety parameters during the intervention were evaluated (Table 3). In both groups the plasma glucose-level decreased within a physiologic range. Neither in the placebo nor in test group any significant alterations on liver enzyme activities GGT, GOT, GPT, pancreatic lipase-activity in the plasma, urinary creatinine, and urea concentration in plasma and urine could be detected. The compliance, tolerance and acceptance evaluated in both groups was always good (data not shown). Both groups showed a significant reduction of body weight (p < 0.01) after 15 days treatment of 3.9 ± 1.5 kg in the test group and 3.8 ± 0.7 kg in the placebo group due to the hypoenergetic intake. A loss of 1.8 ± 1.3 kg fat mass after treatment could be detected in the test group and a reduction of 1.3 ± 0.7 kg in the placebo group. The loss of fat mass in both groups was significant (p < 0.05) but the difference between the groups was not (p = 0.472) (Figure 4). Loss in fat mass after 15 days of dietary intervention with the high fat formula combine 72% MCFA and 22% n-3 LCPUFA without LCFA in comparison to placebo shown as body impedance BIA. It is a widely accepted model of nutrient balance that the metabolic handling of fat energy is likely to induce a positive energy balance mainly because of the inability of dietary fat to promote fat oxidation [16, 17]. Indeed several studies suggest that dietary fat intake and genotype interact to regulate fat deposition [18, 19]. It is an open question, however, whether it is possible to affect the fatty acid profile in the blood plasma by stimulating the fatty acid oxidation with an experimental high fat formula containing MCFA in combination with n-3 LCPUFA but without LCFA. Due to its unique absorption and metabolic characteristics, MCFA oil, consisting of saturated fatty acids with 8–12 carbons, has been used therapeutically since the 1950s in the treatment of fat malabsorption, cystic fibrosis, epilepsy, weight control and to increase exercise performance. Dietary n-3 LCPUFA on the other side have been identified to influence the serum and red blood cell membrane fatty acid composition  and to stimulate the peroxisomal β-oxidation  resulting in an increased basal lipid oxidation. Furthermore, it has been shown that n-3 LCPUFA are an environmental factor in the regulation of body mass reduction . Especially, eicosapentaenoic acid has been suggested to induce the peroxisome proliferator-activated receptor gamma-1 as a key regulator of adipocytes differentiation, lipid metabolism and insulin resistance . Thus, both MCFA and dietary lipids containing n-3 LCPUFA are candidates to stimulate the hepatocellular β-oxidation. The results of the present short term intervention study indicate that a combination of MCFA and n-3 LCPUFA but missing LCFA effected a significant reduction of total plasma triacylglycerols probably due to an increased β;-oxidation of fatty acids. The extent of this reduction was higher than it could be suspected from the individual MCFA or LCPUFA implications on lipid oxidation alone suggesting synergetic effects. Previous Studies in animals  and with infants  suggested that dietary n-3 LCPUFA could decrease the hepatic excretion of cholesterol and biliary cholesterol nucleation time in obese women . In the present trial the cholesterol concentration decreased in both groups due to the cholesterol free diet with no significant differences between the groups. The study also showed a specific effect of the test formula on the plasma fatty acid pattern in comparison to the control. Dietary n-6 and n-3 fatty acids have opposing physiological functions concerning homeostasis, normal development of organs and tissues, inflammation and mental health . On condition that the normal western diet is unbalanced in the n-3 to n-6 fatty acid ratio, it might be necessary to decrease the intake of n-6 fatty acids and increase the n-3 fatty acid intake. Tissue arachidonic acid pools originate from the diet and from the hepatic and extrahepatic desaturation-elongation of dietary linoleic acid. Particularly during fasting linoleic acid is an important substrate (27). To affect the n-3 to n-6 ratio shift the experimental fat blend contains sufficient amounts of α-linolenic acid which daily requirement is 1.5 g C18:3 n-3/day [27, 28], but less linoleic acid compared to the placebo (Table 2). Arachidonic acid increased in the test group and the essential linoleic acid concurrenly decreased, eicosapentaenoic acid and docosahexaenoic acid (C 22:6 n-3) increased (not shown) implying a significant increase of the n-3 to n-6 LCPUFA ratio in the test group compared to the control. 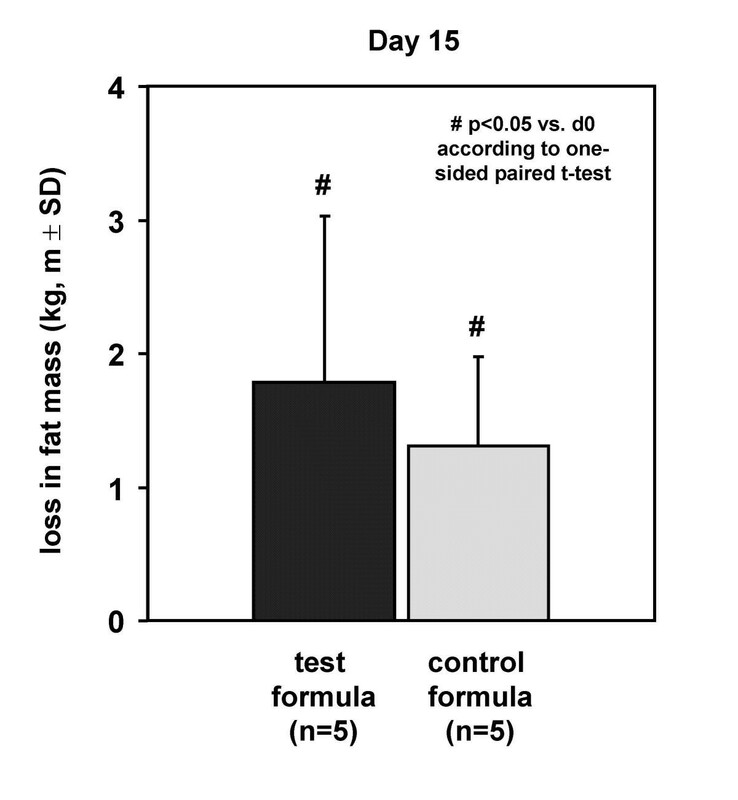 This dietary influence on the plasma fatty acid profile was already pronounced at day 4, although the maximum effect was observed at day 15. Several studies with comparable fish oil supplementations indicated significant eicosapentaenoic acid and docosahexaenoic acid demonstrated without extensive alterations of total plasma fatty acid profile e.g. linoleic acid was not affected [29, 30]. In our study however, the essential linoleic acid decreased in the test group suggesting that MCFA and LCPUFA without LCFA provokes a rapid blood clearance and pronounced increase of n-3/n-6 ratio. The necessary requirement for linoleic acid is 10 g/day [27, 28]. In fact, the reduction of the linoleic acid provoked by the test fat blend is irrelevant during a short term treatment because of physiologic reserves in the fat tissue but may be questionable for long term usage. The metabolic outcome during a long term treatment have to be shown in further investigations. To maintain human health and to support weight control efforts a variety of dietary concepts are discussed that differ exceptionally in the macronutrient content and infringe nutritional guidelines. As the administration of a high fat diet with MCFA may imply the risk of liver injury or an unbalanced glucose-protein metabolism . On this matter several physiological safety parameters were evaluated. Neither significant physiological effects on parameters for liver and kidney disorders (liver enzymes activities in the plasma and creatinine concentration in the urine) nor indicators of muscle decomposition (urea concentration in the urine) or pancreas injury values (lipase-activity in the plasma) could be detected. In contrast to observations that LCPUFA could increase the basal glucose level of plasma , the plasma glucose-level of both test groups decreased within the physiological range. In summary, these data indicate that the experimental formula is safe concerning glucose metabolism, protein digestion, liver and kidney function. With respect to acceptance of hypoenergetic diets the subjective feeling of satiety is always relevant. Carbohydrates may play a greater role for the duration of satiety than does fat but several studies suggested that MCFA are important for other aspects of the control of food intake, especially in satiation at the next meal . In this short term intervention all volunteers reported about their satiety with both formulas possibly due to the high fat content of the trial products. Adult obesity is a health hazard because of its association with numerous metabolic complications , but also childhood obesity is the basis of coronary heart disease risk and mortality in adulthood . From studies in post-obese individuals it is well known that these individuals normally have low rates of fat oxidation that may explain their risk to regain weight . Additionally, it has been postulated that weight loss distinct from energy restriction is associated with improvements in serum lipid levels. In this present study the fat mass reduced significantly in the test group but also in the control group. In contrast to the altered n-3 to n-6 LCPUFA ratio in plasma in the test group, the concentration of storage fatty acids like palmitic acid (C 16:0) (not shown) and stearic acid remained in the homeostasis despite missing LCFA in the test formula indicated a LCFA release from adipocytes. Therefore, the rapid clearance of blood fat induced by an increased stimulation of hepatocytic β-oxidation may represent a new mechanism to loose fat mass and may offer new strategies to prevent the metabolic syndrome. However, implications of the experimental fat blend against obesity have to be investigated in future studies. The work for this publication was supported by a grant of Numico Research Germany. The authors thank M. Möbius and A. Möller for the excellent technical assistance and the nursing and dietary stuff of the Polyclinic, Justus-Liebig-Universität Giessen, Germany for the excellent performance of the study.